Star Road. A seemingly disused building, a church or community hall of some sort. Two in a series of carved blocks incorporated into the brickwork. 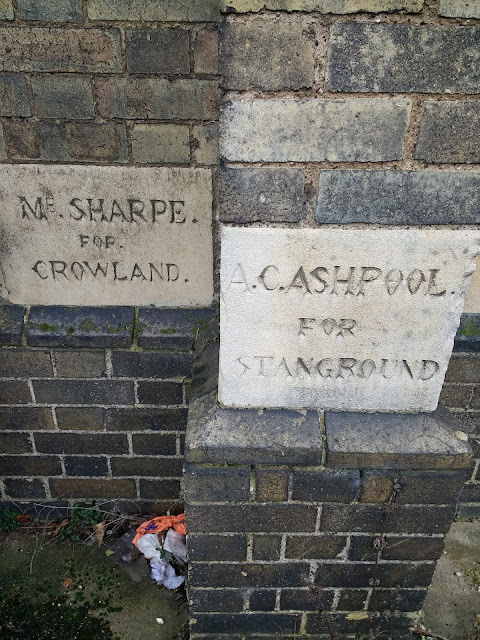 Together they bear the riddle 'Mr Sharp for Crowland, A. C. Ashpool for Stanground'. Crowland and Stanground are places, the former somewhere between Peterborough and Spalding, the latter a residential area in the City. But what of Sharpe and Cashpool and what were they for?